Matt Hagan (Funny Car) and Greg Anderson (Pro Stock) also emerged as No. 1 qualifiers at New England Dragway in Epping, N.H., during the 13th of 24 events on the 2018 NHRA Mello Yello Drag Racing Series schedule. Pritchett retained P1 via a 1,000-foot run of 3.742-seconds at 324.51 mph in her Mopar dragster set during the second qualifying session on Friday. Pritchett, who earned pole position last summer in Epping with a track-record 3.673-second elapsed time, now has nine top qualifiers in her career. Pritchett will open eliminations against Audrey Worm, who is running a limited schedule. 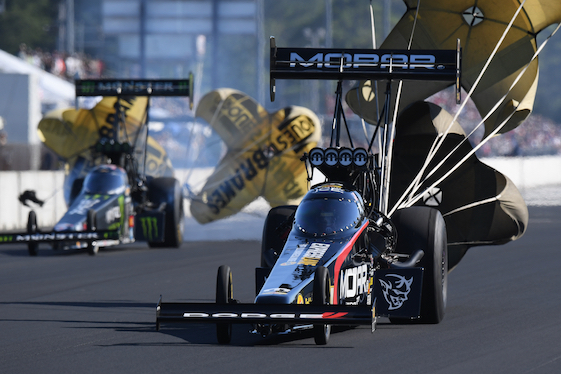 FOX Sports 1 will carry two hours of qualifying coverage beginning at 11 a.m. (EDT) followed by three hours of live finals coverage Sunday beginning at 1 p.m.
Eight-time world champion Tony Schumacher, also of DSR, qualified second after a 3.744-second pass at 330.31 mph during his second run on Friday. “The Sarge” will face Jim Maroney in Sunday’s opening round. DSR’s Hagan earned the Funny Car pole with a 1,000-foot pass of 3.932-seconds at 322.04 mph in his Dodge Charger R/T recorded during his second run Friday. The two-time world champion, who began the weekend tied for second in the point standings with teammate “Fast” Jack Beckman, notched his third pole of the year. Hagan will race Terry Haddock and his Toyota Solara in Round 1 in search of his second consecutive event win at New England Dragway. Beckman, the 2012 world champion, qualified second at 3.956-seconds and 320.20 mph in his Dodge. He will open against Jeff Diehl and his Toyota Camry on Sunday. Anderson held onto the top spot in Pro Stock after covering the traditional quarter-mile in 6.517-seconds at 211.73 mph in his Chevrolet Camaro SS during his second pass on Friday. The four-time world champion locked up his eighth pole of the year and fourth in the past five races. “Yesterday we had the racetrack figured out and today we struggled a bit with the sun out on the track,” said Anderson, of KB Racing. “Today was definitely a learning experience and we’ll get another shot tomorrow. We’ll just have to learn what to do differently.” Anderson will open against Val Smeland and his Camaro in the first round of eliminations. Two-time world champion Erica Enders qualified second at 6.521-seconds and 211.63 mph in her Elite Motorsports Camaro SS during the fourth and final round of qualifying. Enders will begin eliminations against Alan Prusiensky and his Dodge Dart. Top Fuel _ 1. Leah Pritchett, 3.742-seconds, 324.51 mph vs. 16. Audrey Worm, 5.791, 111.38; 2. Tony Schumacher, 3.744, 330.31 vs. 15. Jim Maroney, 4.826, 153.51; 3. Steve Torrence, 3.756, 327.66 vs. 14. Dan Mercier, 4.530, 173.92; 4. Brittany Force, 3.775, 316.60 vs. 13. Mike Salinas, 4.004, 281.77; 5. Clay Millican, 3.778, 328.14 vs. 12. Antron Brown, 3.974, 276.58; 6. Dom Lagana, 3.781, 326.16 vs. 11. Shawn Reed, 3.895, 320.81; 7. Scott Palmer, 3.803, 323.97 vs. 10. Richie Crampton, 3.884, 316.97; 8. Terry McMillen, 3.857, 322.19 vs. 9. Doug Kalitta, 3.874, 303.64. Funny Car _ 1. Matt Hagan, Dodge Charger, 3.932, 322.04 vs. 16. Terry Haddock, Toyota Solara, 5.873, 102.77; 2. Jack Beckman, Charger, 3.956, 320.20 vs. 15. Jeff Diehl, Toyota Camry, 4.316, 289.45; 3. Shawn Langdon, Camry, 3.976, 321.42 vs. 14. Jim Campbell, Charger, 4.203, 300.26; 4. Ron Capps, Charger, 3.978, 320.89 vs. 13. Courtney Force, Chevy Camaro, 4.165, 304.46; 5. Robert Hight, Camaro, 3.979, 324.44 vs. 12. Bob Tasca III, Ford Mustang, 4.126, 281.01; 6. John Force, Camaro, 3.988, 324.75 vs. 11. Jonnie Lindberg, Mustang, 4.118, 307.93; 7. J.R. Todd, Camry, 4.021, 319.67 vs. 10. Tim Wilkerson, Mustang, 4.104, 308.35; 8. Tommy Johnson Jr., Charger, 4.023, 322.58 vs. 9. Cruz Pedregon, Camry, 4.044, 314.09. Did Not Qualify: 17. Mike Smith, 8.701, 102.11. Pro Stock _ 1. Greg Anderson, Chevy Camaro, 6.517, 212.33 vs. 16. Val Smeland, Camaro, 7.224, 148.35; 2. Erica Enders, Camaro, 6.521, 212.49 vs. 15. Alan Prusiensky, Dodge Dart, 6.656, 209.01; 3. Vincent Nobile, Camaro, 6.528, 211.43 vs. 14. John Gaydosh Jr., Camaro, 6.617, 209.75; 4. Drew Skillman, Camaro, 6.538, 212.63 vs. 13. Fernando Cuadra, Camaro, 6.590, 210.60; 5. Tanner Gray, Camaro, 6.540, 212.69 vs. 12. Kenny Delco, Camaro, 6.581, 210.77; 6. Alex Laughlin, Camaro, 6.546, 211.99 vs. 11. Jason Line, Camaro, 6.564, 211.96; 7. Bo Butner, Camaro, 6.546, 212.16 vs. 10. Matt Hartford, Camaro, 6.554, 212.06; 8. Jeg Coughlin Jr., Camaro, 6.547, 212.16 vs. 9. Chris McGaha, Camaro, 6.547, 211.79.